I apologize if I offended you. I am a stranger in this country. And I meant no disrespect to you, or your daughter. I am an American, hiding in Sicily. My name is Michael Corleone. There are people who'd pay a lot of money for that information. But then your daughter would lose a father instead of gaining a husband. I wanna meet your daughter with your permission and under the supervision of your family with all respect. After being permitted an introduction to her at Vitelli's home, Michael presents a gift of a necklace to Apollonia and they quickly develop a romantic friendship. Connie: It was my fault!...Sonny, please it was my fault, Sonny it was my fault. I hit him. I started a fight with him. Please let me be. I hit him so he hit me...Sonny, please don't do anything. Please don't do anything. Sonny: OK. What's the matter with you? What am I gonna do? I'm gonna make that baby an orphan before he's born or what? Huh? Hmmm? (Connie laughs.) All right? Soon after, Sonny finds Carlo on a city stoop and mercilessly beats him, punches and kicks him, bites his knuckles, and repeatedly slams a garbage can lid down on his head. Exhausted, he threatens: "You touch my sister again. I'll kill ya," and as he leaves, he kicks Carlo one last time. He leaves Carlo motionless on his back in the downpour of an open fire hydrant. In a village church in Sicily, Michael marries Apollonia in a traditional Sicilian wedding ceremony, followed by dancing at the reception in the village square. In the privacy of their bedroom on their wedding night, the beautiful young bride removes her silky slip and reveals her breasts to him before they consummate their love (off-screen). Kay, Michael's previous girlfriend, arrives in a cab at the Corleone main gate, asking Tom for Michael's whereabouts. Tom can only tell her: "Nobody knows where he is. We know that he's all right, but that's all." In the wake of violent bloodbath massacres of the Corleones and rival gang members, family violence also escalates. After learning about one of no-good husband Carlo's "whore" girlfriends, Connie smashes every dish in sight in their home. Bullying his wife, Carlo whips Connie with his belt to "clean it up" and then taunts her when she grabs a knife: "Yeah, yeah, come on now, kill me. Be a murderer like your father. Come on, all you Corleones are murderers anyway." She threatens to kill him, but he retaliates with his superior strength and beats her senseless: "Go 'head, now I'll kill you. You guinea brat you. Get out here." In a barely audible voice, Connie phones Sonny after this latest attack. Volatile, Sonny is incensed and leaves to get revenge on Carlo - the "Sonofabitch," but he blunders into a trap that costs him his life. The most violent scene in the film is the spectacular ambush and machine gun assassination at the tollbooths located at Point Lookout on the Jones Beach Causeway. After the tolltaker in the causeway ducks below the window, Sonny is ambushed and massacred by carloads of gangsters with machine guns and a merciless fusillade of bullets. I want no inquiries made. I want no acts of vengeance. I want you to arrange a meeting, with the heads of the Five Families. This war stops now. At his funeral parlor, undertaker Bonasera is asked to repay the earlier favor of justice by offering his friendship and "service" to Corleone: "I want you to use all your powers and all your skills. I don't want his mother to see him this way. Look how they massacred my boy." Bonasera has the impossible task of cosmetically restoring and covering up Sonny's massacred, bullet-riddled corpse and mangled, ravaged face so that his mother can look at him (and not see what death has done to him). Michael's rival-gang enemies learn of Michael's whereabouts and plant a bomb in his car in their villa courtyard, with help in the set up by his bodyguard Fabrizio. Michael senses that the car is rigged with explosives and that the Sicilian bodyguard has disappeared - as Appolonia prepares to start the car. His expressions register his insight, but he cannot save his wife's life. It is not Michael but Apollonia, his young Italian wife and soulmate, who is brutally killed by the explosion intended for her husband. Corleone: How did things ever get so far? I don't know. It was so unfortunate, so unnecessary. Tattaglia lost a son and I lost a son. We're quits. And if Tattaglia agrees, then I'm willing to let things go on the way they were before. Barzini: We're all grateful to Don Corleone for calling this meeting. We all know him as a man of his word. A modest man who will always listen to reason. Corleone: When, when did I ever refuse an accommodation? All of you know me here. When did I ever refuse, except one time? And why? Because I believe this drug business is gonna destroy us in the years to come. I mean, it's not like gambling or liquor, or even women, which is something that most people want nowadays and is forbidden to them by the pezzonovante of the church. Even the police departments that have helped us in the past with gambling and other things are gonna refuse to help us when it comes to narcotics. And I believed that then - and I believe that now. Corleone: I hoped that we could come here and reason together. And as a reasonable man, I'm willing to do whatever's necessary to find a peaceful solution to these problems. Barzini: Then we are agreed. The traffic in drugs will be permitted, but controlled, and Don Corleone will give up protection in the East - and there will be the peace. Barzini: Look, we are all reasonable men here. We don't have to give assurances as if we were lawyers. Corleone: You talk about vengeance. Is vengeance gonna bring your son back to you? Or my boy to me? I forego the vengeance of my son. But I have selfish reasons. My youngest son was forced to leave this country because of this Sollozzo business. All right. And I have to make arrangements to bring him back here safely, cleared of all these false charges. But I'm a superstitious man. And if some unlucky accident should befall him - if he should get shot in the head by a police officer, or if he should hang himself in his jail cell, or if he's struck by a bolt of lightning - then I'm going to blame some of the people in this room. And that I do not forgive. But that aside, let me say that I swear on the souls of my grandchildren, that I will not be the one to break the peace that we've made here today. Michael: I'm working for my father now. He's been sick, very sick. Kay: But you're not like him, Michael. I thought you weren't going to become a man like your father. That's what you told me. Michael: My father's no different than any other powerful man (Kay laughs), any man who's responsible for other people. Like a senator or a president. Michael: Oh, who's being naive, Kay? Kay, my father's way of doing things is over, it's finished. Even he knows that. I mean in five years, the Corleone Family is going to be completely legitimate. Trust me. That's all I can tell you about my business. Michael asks her to marry him and promises that he will go legitimate in five years. Kay objects that "it's too late," but Michael persuades her that they can "have a life together...have children, our children" - they marry in 1951. By 1952, Michael has taken over more and more of the business, with the Don's permission, planning to expand his family's operations (legal gambling, prostitution, and narcotics) into Nevada (Las Vegas), with Carlo serving as his "right-hand man," and Tom Hagen as "our lawyer in Vegas" - no longer consigliere. Hagen asks why he is "out" and is told: "You're not a wartime consigliere, Tom. Things may get rough with the move we're trying." The Corleone Family is thinking of giving up all its interests in the olive oil business and settling out here. Now Moe Greene will sell us his share of the casino and the hotel so it could be completely owned by the Family...I'll make him an offer he can't refuse. You god-damn guineas really make me laugh...Yeah, let's talk business, Mike. First of all, you're all done. The Corleone Family don't even have that kind of muscle anymore. The Godfather's sick, right? You're getting chased out of New York by Barzini and the other Families. What do you think is going on here? You think you can come to my hotel and take over? I talked to Barzini. I can make a deal with him and still keep my hotel...Sonofabitch, do you know who I am? I'm Moe Greene. I made my bones when you were going out with cheerleaders! After Greene has left, Fredo blasts his brother: "Mike! You don't come to Las Vegas and talk to a man like Moe Greene like that!" Michael reprimands Fredo for opposing Family interests and supporting Greene (as Sonny had done earlier): "Fredo, you're my older brother, and I love you. But don't ever take sides with anyone against the Family again. Ever." Barzini will move against you first. He'll set up a meeting with someone that you absolutely trust, guaranteeing your safety. And at that meeting, you'll be assassinated...It's an old habit. I spend my life trying not to be careless. Women and children can be careless, but not men...It could be anyone...I never, I never wanted this for you. I worked my whole life - I don't apologize, to take care of my family. And I refused to be a fool dancing on a string held by all those - big shots. I don't apologize; that's my life. But I thought that...when it was your time that - that you would be the one to hold the strings...This wasn't enough time, Michael, it wasn't enough time...Now listen, whoever comes to you with this Barzini meeting, he's the traitor. Don't forget that. In a vivid death scene among the tomato plants in 1954, the Don plays with Michael's three year old son Anthony, his grandchild. He teaches Anthony how to use a spray can, and then scares him by putting a sliced piece of orange peel in his mouth and pretending to be a grotesque boogey monster. [The suggestion is that he is a monster underneath his grandfatherly figure.] He comforts his frightened grandson in his arms. While running with the boy in the garden, the Don suffers a fatal heart attack. His funeral is attended by family mourners and rival gang member Barzini. Following the service, turncoat Sal Tessio whispers in Michael's ear that "Barzini wants to arrange a meeting (to) straighten any of our problems out." In the final extraordinary baptism scene, probably occurring in 1955, Michael acts as godfather at the christening of his sister Connie's (and Carlo's) child, his nephew and namesake. [The infant in the scene is director Coppola's daughter Sofia Coppola in an uncredited role.] The scene brilliantly crosscuts back and forth from the church to locations throughout the city as gangland murders are orchestrated. With controlled intensity, Michael engineers a cold-blooded mass killing of Barzini, Tattaglia, Greene and all other rival gangleaders of the Five Families to settle the "Family business." While methodically committing the series of vicious and bloody counterattack murders to confirm his position as the new godfather, he is at the church altar listening to holy recitations of the priest during the baptism - in juxtaposed scenes. He targets each of the Dons of the other leading Families in New York, plus a mobster in Las Vegas. Tell Mike it was only business. I always liked him...Tom, can you get me off the hook? For ol' times' sake? Michael: Come on. Don't be afraid, Carlo. Come on, you think I'd make my sister a widow? I'm Godfather to your son, Carlo...You're out of the Family business, that's your punishment. You're finished. I'm putting you on a plane to Vegas...I want you to stay there, understand? Only don't tell me you're innocent. Because it insults my intelligence and makes me very angry. Now, who approached you? Tattaglia or Barzini? Clemenza is ordered to murder Carlo in a brutal and painful manner - strangling him from behind while inside a car bound for the airport. Carlo valiantly kicks a hole through the car windshield as he tries to break free while being choked to death. Kay: Michael, is it true? Michael (slamming his hand on the desk): Enough. All right. This one time, this one time I'll let you ask me about my affairs. Kay (whispering): Is it true? Is it? Michael (quietly, shaking his head): No. Kay (sighing relief): (Michael kisses and hugs her.) I guess we both need a drink, huh? She leaves his study to fix a drink, shaky but smiling. 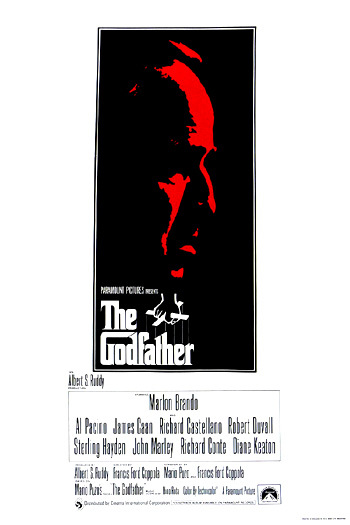 At the same time, family henchmen Rocco Lampone, Clemenza and Al Neri (known as Michael's 'Luca Brasi') enter Michael's study, telling him of the successful assassinations of his enemies and betrayers, and paying tribute. Kay stares at them in the study - Clemenza embraces Michael, shaking and kissing his hand, clearly anointing him as the new Don Corleone of the Family: "Don Corleone." Rocco is the second one to kiss his ring hand. [The Godfather, Part II (1974) begins with this shot.] Michael has emerged as the new Godfather in his father's image, an image he once sought to escape. Symbolically, the door in Michael's office is shut on Kay by Neri. The door blocks and excludes her view - rubbing her out of the heart of his life and clearly delineating the two worlds. The screen turns to black as the ending credits begin to scroll.